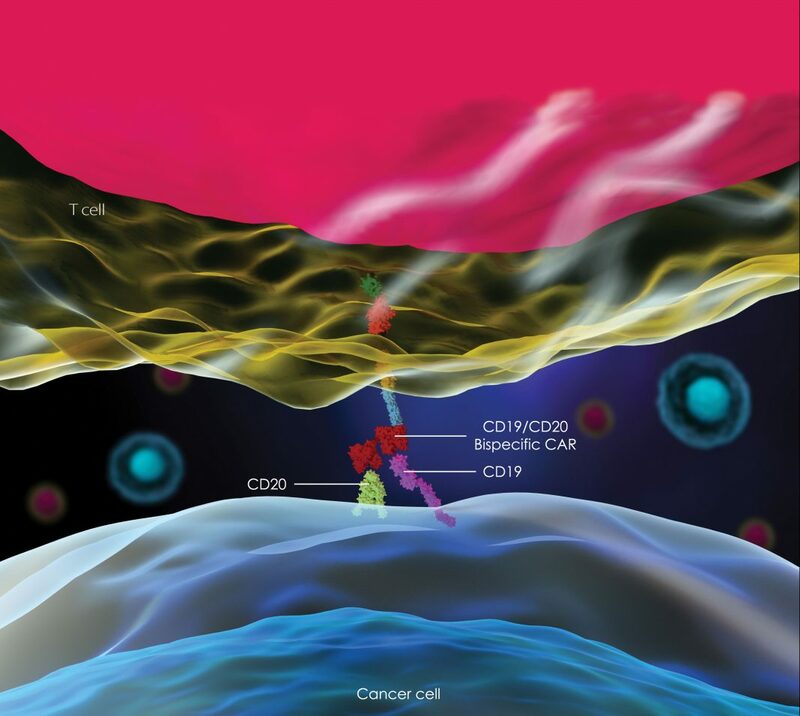 Cancer immunotherapy has been advancing on several fronts, most strikingly in the direction of checkpoint inhibition and chimeric antigen receptor (CAR) T-cell therapy. Another front, however, is about to see its share of action. Here, newly engineered bispecific and multispecific antibodies will be put to the test. Such antibodies may engage two or more antigens at once, serving as force multipliers that can exploit opportunities beyond the reach of monospecific antibodies, whether they are deployed solo or in teams. Although monospecific antibodies are beginning to show their limitations, they should be recognized as part of a sequence of antibody-based cancer immunotherapy developments, a sequence that reaches back at least as far as the Nobel Prize–winning efforts of James P. Allison, PhD, and Tasuku Honjo, MD, PhD. Allison’s work on the CTLA-4 led to the first FDA-approved checkpoint inhibitor drug, ipilimumab (Yervoy, Bristol-Myers Squibb), whereas Honjo’s discovery of PD-1 led to the development of anti-PD-1 drugs such as pembrolizumab (Keytruda, Merck). These drugs and other checkpoint inhibitors have profoundly impacted the treatment of cancer. An alternative cancer immunotherapy approach, namely CAR T-cell therapy, has also demonstrated its potential to combat cancer. In this approach, T cells are engineered to launch sustained attacks on tumors. Although CAR T-cell therapies clearly have fight in them, they may cede some anticancer glory to bispecific antibodies (bsAbs). The first FDA-approved bsAb to directly compete with CAR-T was the CD19/CD3 drug blinatumomab (Blincyto, Amgen). It was introduced in 2014 for indications in B-cell precursor acute lymphoblastic leukemia. Even while monospecific antibody–based checkpoint inhibition therapies and CAR T-cell therapies continue to be improved, bispecific and multispecific antibodies are shaping up as a cancer immunotherapy options that may provide significant advantages. At present, companies such as Amunix Operating, Invenra, Glycotope, and Xencor are working independently and in collaboration with larger pharmaceutical companies, such as Novartis, Daiichi Sankyo, and Roche, to bring bispecific and higher-order antibodies into the cancer immunotherapy market. Fundamentally, their engineered expression platforms focus on streamlining novel antibody development, reducing the risk factors to patients, and optimizing tumor destruction. bsAbs emerged with the technologies developed by two pioneering companies Amgen and MacroGenics. Amgen introduced the BiTE platform; MacroGenics, the DART platform. Despite the availability of such platforms, it can still be a challenge to produce bsAbs that incorporate an Fc domain, suggests John Desjarlais, PhD, senior vice president of research and CSO at Xencor. “If you don’t have an Fc domain,” he says, “you have a very short half-life,” necessitating low and frequent injections or continuous infusion in patients. Xencor’s solution was to build a robust and GMP-scalable bispecific platform that includes an engineered Fc domain for the antibody, ensuring that antibodies produced with this platform would have a longer half-life in vivo. Xencor’s XmAb Fc platform increases this efficiency of heterodimer Fc formation to 95% out of the gate. Xencor is exploring bsAbs that act as dual checkpoint inhibitors, such as anti-PD-1/CTLA-4 and CTLA-4/LAG-3. The field has learned that cancer evolves to suppress the immune system by engaging different pathways meant to protect the body against autoimmunity. In addition to checkpoint inhibitors, Xencor has been successful in establishing two Phase I trials in collaboration with Novartis involving T-cell-engaging bsAbs; one that has an AML indication and binds to CD123 on AML blasts and CD3 on T cells, and a second that binds to CD20 on malignant B cells and CD3 on T cells. The company has a third wholly owned bsAb that binds CD3/SSTR2 (somatostatin receptor 2). Currently in Phase I trials, this bsAb is being explored with dose escalation in neuroendocrine tumors. Amunix has developed a new format of bispecific T-cell engagers that can be delivered in a low dose with lower toxicity using XTEN technology, an alternative to PEGylation. “The T-cell engager,” Schellenberger explains, “works like an adaptor molecule. 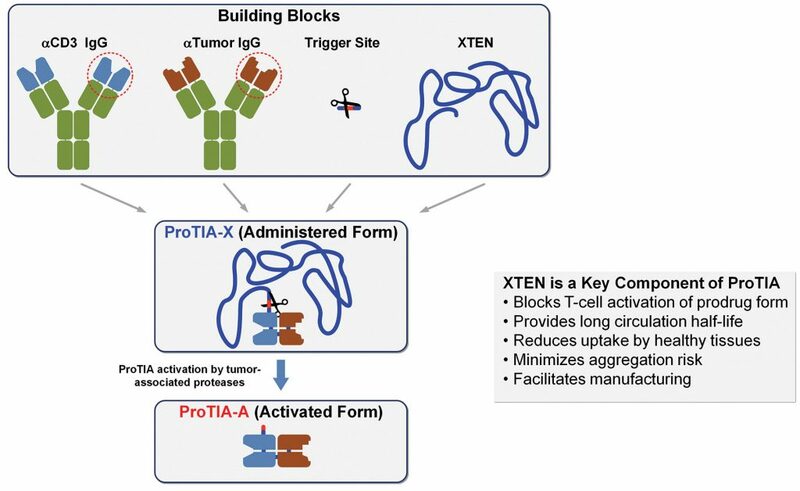 It bridges the tumor and the T cell.” XTEN is a protein polymer that is engineered to behave like polyethylene glycol (PEG) which is attached to bsAbs to increase their half-life in vivo without the need for an Fc domain. The company’s lead XTENylated bsAb, AMX-268, is in preclinical development. It is a T-cell engager that binds to CD3, a T-cell receptor (TCR), and EpCAM, an adhesion molecule overexpressed in 80% of solid tumors. Amunix has used its XTEN platform to develop protease triggered immune activator (ProTIA) molecules. These are bispecific T-cell activators that are designed to outperform other bispecific formats with respect to characteristics such as half-life and safety. An early ProTIA prototype molecule, one that incorporated Amgen’s MT110, allowed Amunix to demonstrate the ProTIA format’s advantages. Amunix is now replacing the Amgen-specific portions of the prototype to generate additional ProTIA molecules. The active form of the drug is smaller than typical Fc-containing intact antibodies, allowing it to be removed easily and rapidly through the kidney. Schellenberger’s data suggests that AMX-268 may have lower immunogenicity and a lower toxicity profile among other potential EpCAM-targeting T-cell engagers such as Removab (Fresenius Biotech) and the investigational MT110 (Amgen). 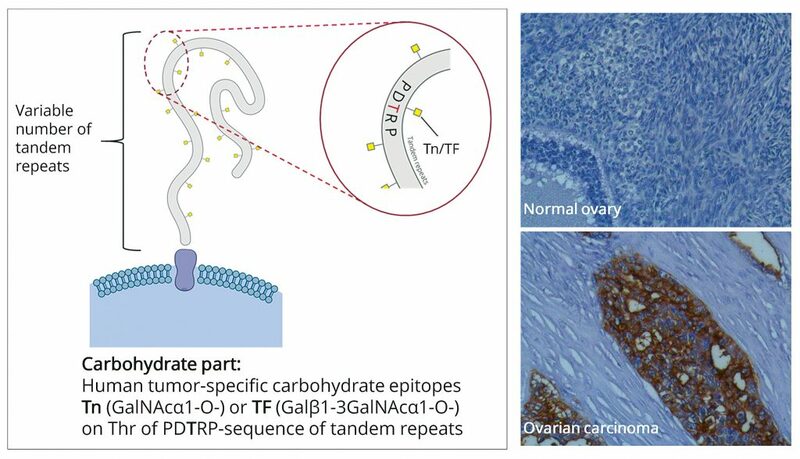 The company’s first-in-class mAb, Gatipotuzumab, targets the tumor-specific epitope TA-MUC1, a novel combined carbohydrate/peptide conformational epitope on the tumor marker MUC1 (mucin-1). This antibody shows broad therapeutic potential in 80–100% of its main solid tumor indicators (that is, ovarian, lung, and breast cancers). A second molecule in development at Glycotope is PankoMab-PDL-GEX, which combines binding to TA-MUC1 with immune checkpoint molecule PD-L1 attached to a glycol-optimized functional Fc domain. PankoMab-PDL-GEX is designed to direct checkpoint blockade to the tumor and thereby enhance tumor cell killing. Aberrant glycosylation patterns specific to cancer cells can be targeted by engineered antibodies, such as those developed by Glycotope using its GlycoExpress (GEX) platform. For example, the company’s PankoMab-GEX antibody recognizes a tumor-specific epitope of MUC1 (TA-MUC1). Left: Schematic illustration of MUC1 highlighting the PDTRP motif, which has a conformational epitope induced by the carbohydrate antigens Tn or TF. Upper right: Normal ovarian tissue, which lacks PankoMab-GEX staining. Lower right: Ovarian carcinoma detected with PankoMab-GEX, which can recruit the immune system to destroy tumor cells. Although Glycotope is not exclusively focusing on the bsAb market, Jäkel suggests that there are many possible advantages to targeting two epitopes over monospecific antibodies, including increased specificity and/or avidity, increased inhibition of tumor growth, enhanced local tumor cell killing, and blockade of immune checkpoint inhibitors. In immuno-oncology, a well-trod path is the redirection of tumor T cells. A less-well-traveled path is being explored by Invenra, which seeks to activate functional processes that require a novel mechanism of action through bispecific and higher-order antibody binding. Antibodies that drive this type of receptor clustering are the focus of Invenra’s ARCHER (Agonistic Receptor Clustering by High-order Exogenous Rearrangement) technology. One of the receptors in the TNF superfamily, OX-40, is the target of an Invenra bsAb in lead selection. A bacteriophage library that consists of wholly human Fab fragments and that matches the natural diversity found in the human repertoire can provide the starting point for selecting Fabs of interest used in Invenra’s B-Body platform, Hammer says. A domain-substitution strategy with a few orthogonal chain mutations allows for highly specific light chain–heavy chain pairing and enables high-throughput production and purification of bispecific and multispecific antibodies. “We found that you can predict some things [during antibody design],” she reports, “but a lot of it is through empirical testing. The affinities for the antibodies, the geometry, and the epitopes that you’re hitting matter.” One other group of multispecific antibodies in Invenra’s pipeline consists of discovery candidates that create higher specificity through the targeting of more than one antigen. “These candidates are the bispecific antibodies we call the SNIPERsTM,” says Hammer. Currently a regulatory T cell–depleting SNIPER molecule is in lead selection. Previous articleTissue Engineering Market in the U.S.